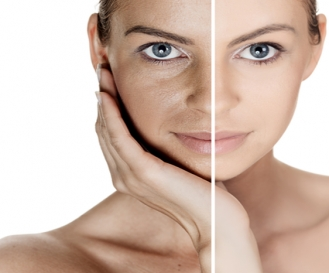 Pigmentation of skin is directly correlated to ageing. Hormonal changes that come about with ageing give rise to uneven skin tone and dark spots. Pigmentation cannot be removed by applying lotions or creams bought from medicine shops or provision stores. Pigmentation treatment as suggested by dermatologists or expert beauticians at Khoobsurat is the safest and most effective way of removing pigments. Pigmentation is caused by excess deposition of melanin, and its treatment involves prevention of this deposition. Hyperpigmentation or excess deposition of melanin is of three types: melasma, PIH (post inflammatory hyperpigmentation), and lentigines. Chemical peels – Glycolic acid is the principal ingredient of chemical peels. This chemical causes the epidermis to shed. This is a painless procedure lasting for about 10 minutes. However, a tingling sensation is possible. Laser – Only trained dermatologists are engaged by Khoobsurat to do laser treatments for removal of pigmentation. 2-6 sittings are required for this treatment. Prescription creams – These creams with a combination of retinol and hydroquinone take multiple weeks for removing pigmentation.